Here's to the woes of a complicated little salad. This dish breaks all of my Farmers Market Kitchen rules — it has several components, each with its own long list of ingredients and set of preparations. It starts with my own home-cured guanciale, which hung for 60 days in my pantry. For people who don't make charcuterie for fun, any thick-cut bacon will do. But the beans — from Morningstar Meadow Farm in Glover — first soaked, then boiled, then baked — take at least an overnight, plus two hours to prepare. 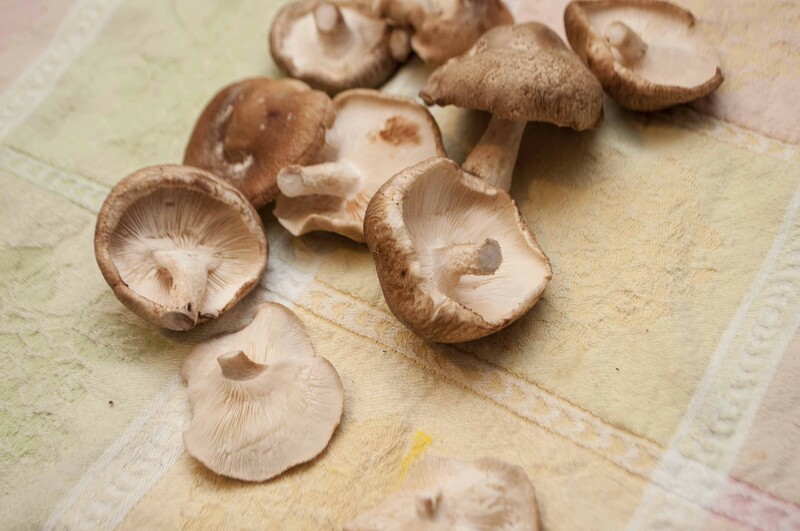 The mushrooms (also grown locally, at AH Mushroom in Colchester) are marinated, then pan-fried. The bulgur is scented with no fewer than three different spices. Finally, the greens are warmed and dressed — but that's the easy part! If it seems like a lot of fuss for a bit of salad, it is. But I have to say that it's one of the finest salads I've ever created. If I had to review it at a restaurant, I'd give it a true rave. What's more, all but the greens can be made in advance and repurposed for other dishes. I've been using the beans as a side dish for days, and the mushrooms are stellar on pretty much anything. But all together on a plate, the flavors just marry so beautifully: a little salty, a little sweet, hints of bitter and spice. Served warm, it's a greeny winter dish that will comfort until, at long last, the cold gives way to spring. Here's a fussy little salad for you. Prepare all of the components first; you want them to be warm when served. When you're ready to serve the salad, place a handful of dressed greens on each plate. Keep it neat and nest-shaped. 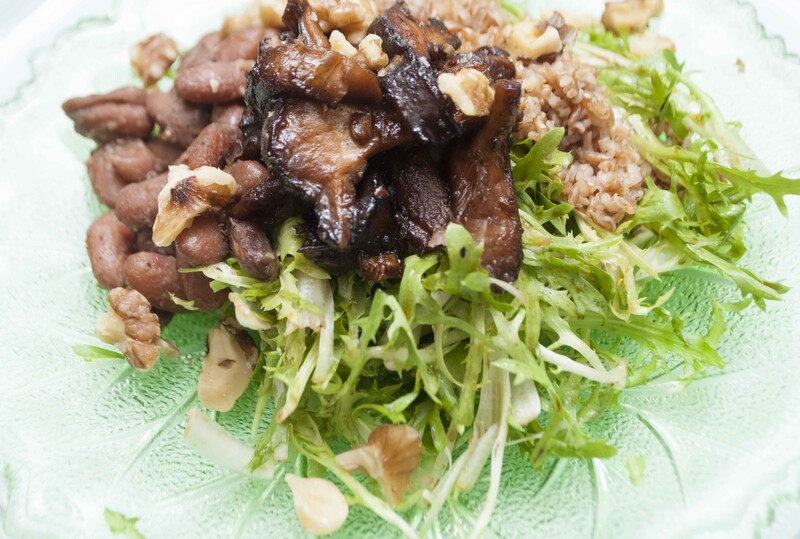 To each plate, add two to three tablespoons of the beans and bulgur, and top with a couple tablespoons of the mushrooms and a scattering of walnuts. Serve immediately. In a 10-inch skillet, render pork over medium heat until it begins to crisp. Add the garlic and onion and sauté in pork fat until clear. Add the beans and sauté briefly so the skins just blister. Add the liquid and cook until beans soften and begin to swell and crack, 45 minutes to one hour. Preheat oven to 425 degrees. Pour the bean mixture into an oven-safe baking dish (a loaf pan works well for this) and bake for one hour, stirring occasionally, until most of the liquid is absorbed. Mix the garlic, miso and liquid ingredients together in a quart container or bowl. Add the shiitakes and stir thoroughly until all are well coated. Marinate for at least half and hour, stirring occasionally. Heat a skillet over high heat. When it's hot, add the mushrooms and marinade. Reduce the heat just a little and sauté, stirring constantly, until the liquid is gone and the mushrooms are deeply browned and starting to candy. Cook one portion of the grains (about 1/2 cup, dry) as directed, with a teaspoon or so of tamari and a few shakes of garam masala, allspice and cinnamon. Wash one small head of frisée lettuce in warm water. Spin or shake dry, cut away the base, and tear the leaves in half, so the head falls into 3- to 4-inch pieces. Dress lightly with just a little salt and pepper and a spash each of extra-virgin olive oil, tamari and balsamic vinegar. Grains and Greens and Roots, Oh My!